KOA Speer Electronics, a leading supplier of passive electronic components, has announced that its TLRH3AW metal plate chip current sense resistor now features an extended resistance range of 10mΩ ~ 270 mΩ with greater corrosion protection and higher temperature resistance up to +170°C. Vishay Intertechnology Inc. announced a new surface-mount Power Metal Strip® resistor featuring a wide side terminal construction that yields a high 2 W power rating in the compact 1020 case size. The WSL1020 combines its high power-to-footprint-size ratio with extremely low resistance values down to 0.003 Ω and stable resistance tolerances to 0.5 percent. 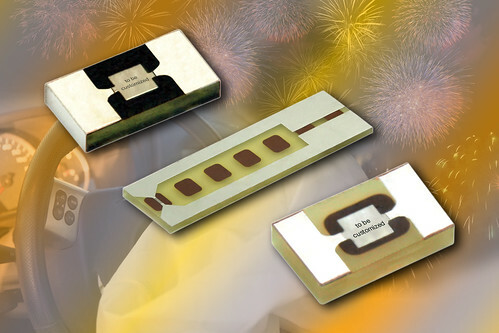 To meet the demanding needs of pyrotechnic engineers, Vishay Intertechnology Inc. introduced a new massive electro-pyrotechnic ignitor chip (MEPIC) resistor offering Joule effect or flash ignition for fast firing times down to 250 µs.